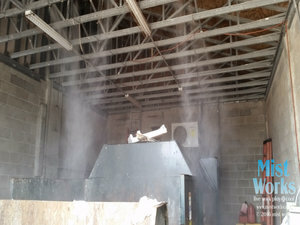 Industrial industries have many uses for misters; warehouse cooling, dust suppression, odor control, cement curing, glue setting, bird abatement, mosquito and flying pest control, cooling tower misters…the uses for mist have no end! Just a few of the industries that use our misting systems are construction companies, RV manufacturers, paper plants, manufacturing facilities, wine storage, wood working, textiles, landfills, transfer stations, animal shelters, auto manufacturing plants and the list is just too long to go on. 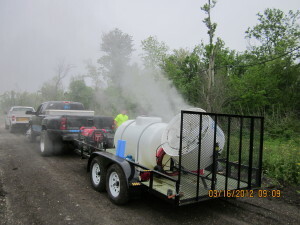 Dust Suppression We have portable fans for moving from job to job to control airborne dust without wetting, or we can design an installed mist system for permanent locations. 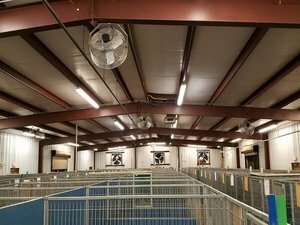 Warehouse Cooling We can cool your large warehouses without any surface wetting, using our high velocity stainless fans and our PHD & EXD series misting pumps, that we build in Florida. Exhaust panel style fans are also available. Humidification Our mist systems are highly efficient in humidification for produce, manufacturing plants needing to maintain certain humidity levels, and for a variety of humidity needs. 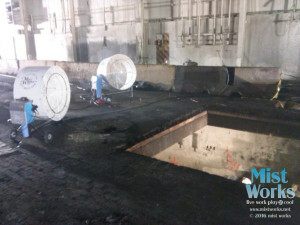 Stationary installed misters and portable systems with or without fans can be custom designed for you. Call us at 877-647-8326 and lets see how we can help your business with our industrial misting systems and ventilation fans.